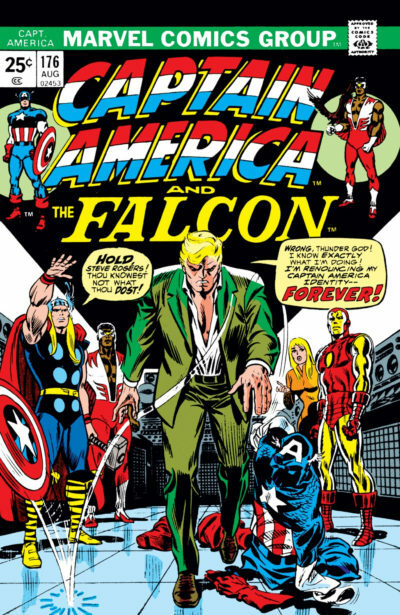 This early 70s run on Captain America is mostly memorable for the majority of it being drawn by Sal Buscema, who never turned in an unremarkable comic issue in this period, and for a pair of Captain America doubles that resolved a glitch in his history and introduced us to Nomad! This run opens on a somewhat downtrodden Captain America. After a falling-out with Nick Fury over Cap’s partnership with Falcon, Fury strips Cap of SHIELD’s assistance – which also takes his lover Sharon Carter out of the picture in an official capacity. 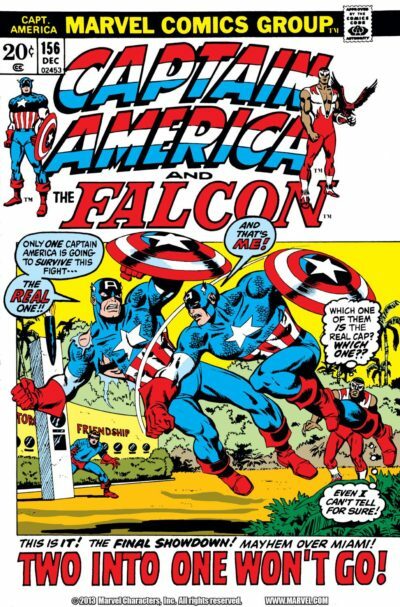 Cap also slightly at odds with Falcon, who is more focused on taking care of his community than any heroic adventures. This is a period of brisk one and two issue plots, typically with a cliffhanger leading into the next story (and a hilarious tendency to use the same shot of Cap walking away with his back toward the viewer). Gerry Conway writes an affable, easy-to-read Cap, though his Steve Rogers can be a bit of a sad sack. It helps to have Falcon’s plots occasionally branching off from the main narrative, though Conway’s scripting of Falcon is hopelessly dated. He’s at least fun to look at, as Sal Buscema beautifully renders his muscled frame and slightly-silly costume. While Buscema’s artwork is clearly a product of the 1970s, it remains perfectly engaging and only the slightest-bit dated. That’s not only because of his cinematic eye for panel framing, but because he drew such a detailed world for Cap and Falcon. If you’re tempted to take him for granted, the few issues here by other artists will cure you of the urge. They’re not bad by any means, but they’re not Buscema. Steve Englehart takes over scripting at #153 for over 30 issues, mostly with Buscema. Englehart kicks off his run by resurrecting the 1950s Captain America, retconning him as the slightly unhinged William Burnside in the ongoing effort to repair Marvel’s pre-Silver Age Cap continuity after Stan Lee rendered nearly two decades of it unusable by having Steve Rogers frozen in a block of ice. Englehart doesn’t fare any better with Falcon, nor with Sharon Carter – who remains a minimally capable damsel in distress in many of these stories. He also brings in the 1950s racist caricature Yellow Claw and resurrects the low-selling original X-Men, for good measure. Yet, it’s the end of Englehart’s run that distinguishes this potential omnibus of material. It was he who originated of the “Secret Empire” title, shared by the plot currently playing out in Marvel’s controversial 2017 event series. Though the original isn’t nearly as lurid, it shared the trait of being a surprisingly timely commentary on mistrust of the American political establishment as it played out against the Watergate investigation and culminated the same month as President Nixon’s resignation! And, that original Secret Empire story ended with Steve Rogers forsaking his Captain America Mantle to become Nomad! Will we see this omnibus in 2018? Signs point to no. Marvel tends to tie these Silver Age omnibuses to movies, and while there isn’t another Captain America movie out there is the superhero bonanza of Avengers: Infinity War. However, 2018 feels a little quick on the heels of the final Masterwork of this run. Would I recommend buying it? You should absolutely buy this if you want a complete, four-volume bookshelf of Silver and Bronze Age Captain America. As for reading it on its own merits, I’m torn on recommending it. Secret Empire and the following Nomad issues aside non of this is particularly memorable. 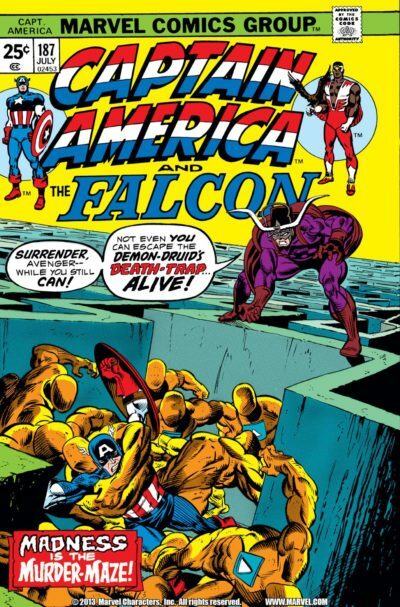 Yet, this is a great-looking Captain America run, Englehart is a strong author, and it comprises the majority of Falcon’s co-titled issues prior to Kirby taking over with issue #193. Ultimately, I think this is just as strong a Silver/Bronze Age sampler as any of the other surrounding Cap omnibuses – and perhaps a bit stronger due to Sal Buscema’s artwork.